It’s as much a part of me as cooking is. When I wasn’t in the kitchen with my Grandma, we were out in the garden with her and my Grandpa. If you couldn’t find us there, we were on one of the many farms held by various family members all over the southern states in either Florida, Georgia, or Alabama. I loved being outside, and I loved being in the garden or on a farm. Picking the peaches off the peach trees of my Aunt P’s farm right outside of Dothan, Alabama was one of my favorite things to do. She would give me a basket and say to me “Binky! Go pick them peaches, and if you pick good one’s we’ll have us some cobbler after supper” OH THE COBBLER! I miss that cobbler, but I digress. Shhhhh… Don’t tell my aunt, but I used to eat more peaches than I picked. I’d fill my basket and sit down under one of those trees with a water hose to clean the peaches and eat to my hearts content… Oh, those were the days. Sticky, sweet, juicy peach filled summer days. Mr. Foodie built this box and surprised me one day after work. I was so grateful. It was lovely, beautiful and perfect, as I had been wanting to do this for quite some time. It was at the beginning of spring when we started this thing. It was still cold. It was still wet; it was still miserable. But we were determined. 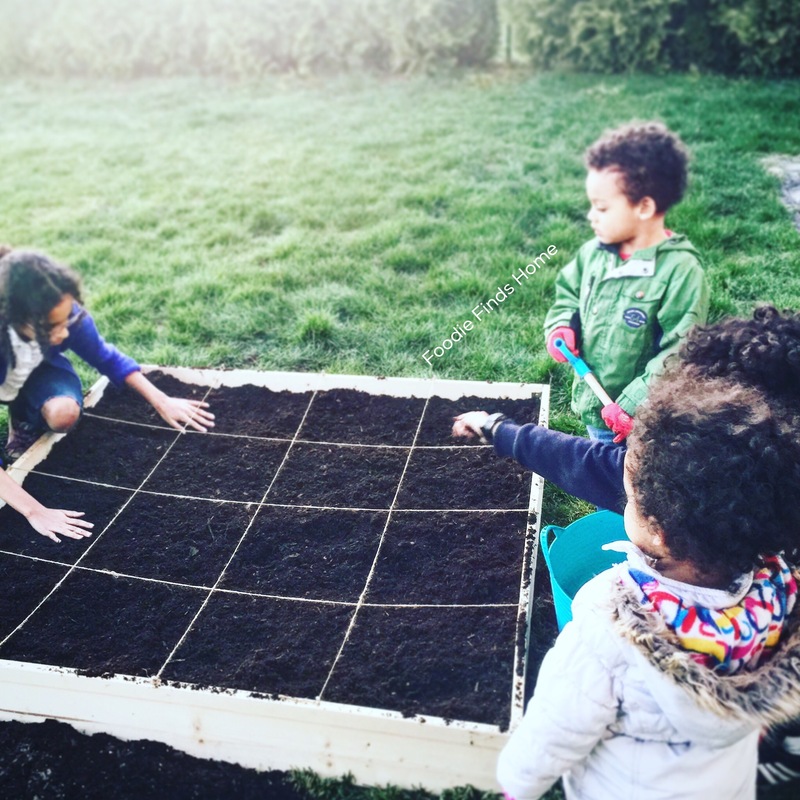 I grew up with a garden, and it is an experience that I want to share with my children no matter where we live; no matter how much or how little space we have… I want them to know how to grow food. I want them to know how to be able to cultivate the earth, and I’m proud to say that after a few short months of being faithful in their care and keeping of their crops; they are now producing a harvest. As you can see where there was merely dirt, there is now a robust garden blooming full of items that are soon to be pulled and enjoyed in our kitchen. 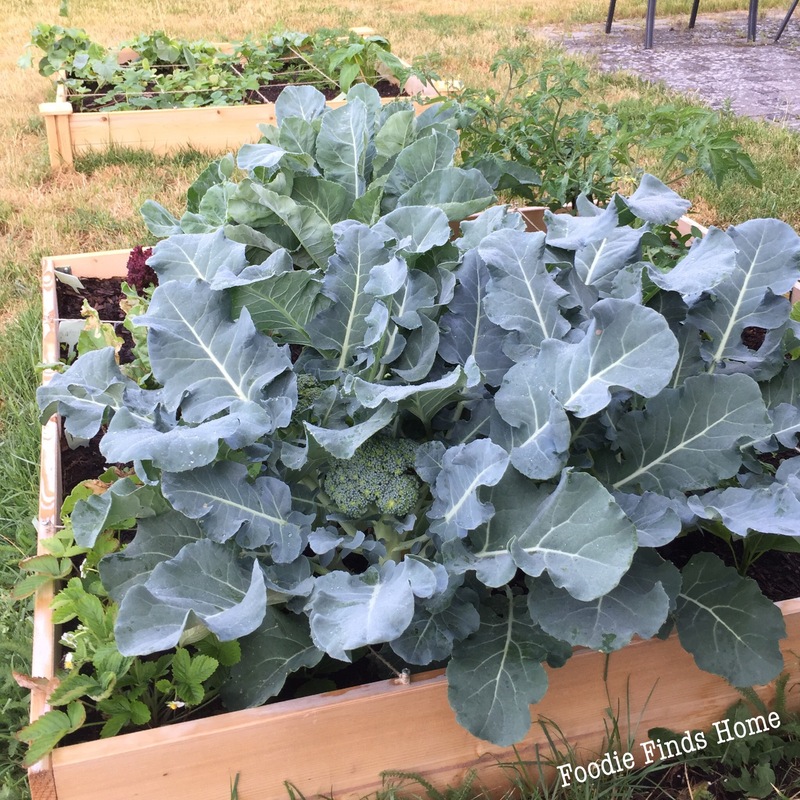 There are several varieties of fruits and vegetable planted throughout the two squares. We have broccoli, strawberries, radishes, carrots, lettuce, garlic, peppers, tomatoes, and many other items. We’ve started our fall seedlings and are looking forward to turning over the garden for pumpkins, corn, and autumn/winter squash. Don’t fret; I have another post coming up to tell you all about exactly what went into creating the boxes and the mix I used as we had to improvise living abroad for the dirt. However, right now I just want to say how proud I am of the kids for sticking with this and seeing the “fruits” of their labor come to true… They even helped me plant two blueberry bushes. So stay tuned into our garden series; I have a feeling this will be a part of Foodie Finds Home for years to come. It looks like your garden is coming along nicely 🙂 My two have been growing their own fruit and veg this year. So far they have apples starting to come through, strawberries, lettuce, cucumber, radishes and tomatoes. They’re so proud of themselves. Gardening is just as rewarding! I love being able to grow the food, and then recreate it into family dinners.